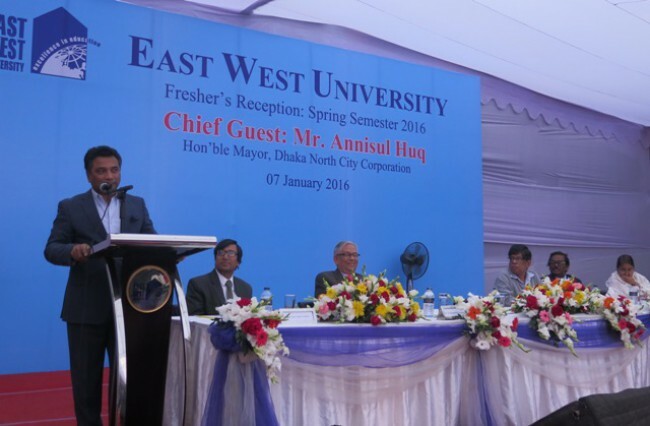 In the freshers reception programmed of East West University the City Mayor talked about launching new bus service for students. The mayor of Dhaka north City Corporation Anisul Huq mentioned that there will be standard bus service for the students of Dhaka soon. In order to reduce the use of personal vehicle and to reduce misery of the students of Dhaka, 3 thousand new standard buses will be running in the street of Dhaka. There will be 1000 Ac buses out of those 3000 buses. To avoid traffic jam, 5 companies will operate these buses instead of current 180 companies. The vice-chancellor of East West University Dr. M M Sahidul Hasan and former governor of Bangladesh Bank Dr. Md. Faras Uddin also gave their speeches in the programme.